"Weddings - Bowins - Matoney"
Dr. and Mrs. Arnold H. Maloney, Sr. are shown following their wedding here recently. 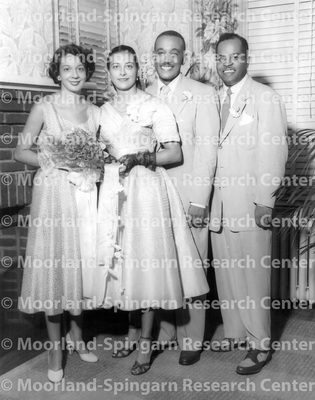 With them at left is Mrs. Evelyn Selden, matron of honor, and Dr, Charles Lomack, at right, best man. Mrs. Maloney is the former Inez J. Bowins.